Welcome to the Retro Photojournalism Blog. We hope to bring you the latest in photojournalism news as well as updates on the progress of this website as we attempt to catalog thousands of David Vine's photojournalism images from the 60's and 70's. Please check back in regularly for new posts, and feel free to comment or email us if there is something you would like to see. Thank you for your interest! Welcome to the Retro Photojournalism Blog. We hope to bring you the latest in photojournalism news as well as updates on the progress of this website as we attempt to catalog thousands of David Vine's photojournalism images from the 60's and 70's. Please check back in regularly for new posts, and feel free to comment or email us if there is something you would like to see. A Dale Laboratories advertisement as it appeared in the June 1981 issue of Popular Photography. I have been derelict my duty to you as a visitor to this site. No posts in a month or more is bad for me and a disappointment for people who have visited this site. SORRY! There have been two developments this week that compel me to share this post with others who may be interested. I recently purchased the Sony NX30 for my documentary work. The camera is sold separately but you can purchase Sony complete outfit called "Video Journalist Backpack." I can't afford the four grand to purchase it but I did want to see details on its contents and the construction of the backpack in which it was packaged. I already own most of the equipment that comes with the standard VJB. In the process of researching that VJB topic I came across Bill Gentile and a video interview of him that you will probably like if you've read this far. He has a four-day course and a video version of his Backpack Journalism workshop. BTW, the interview video was originally a Google "Hangout" which is a great mechanism for live viewing and recording of content. Bill Gentile is an independent journalist and documentary filmmaker teaching at American University in Washington, DC. His career spans three decades, five continents and nearly every facet of journalism and mass communication, most especially visual communication, or visual storytelling. I've been studying storytelling to help me make my project more appealing and interesting. I'm more of a "Just the facts, mam" Jack Webb (Dragnet) kind of journalist so I need to humanize my work. Take a look at Bil'ls videos on YouTube and check out the videos of his work on his own website. The second development this week was my discovery that a mentor to me during my early years was elected to the Connecticut Journalism Hall of Fame. I'll do a separate post on that probably as early as tomorrow. This morning I suddenly felt the awe and wonder that Mulder and Scully exhibit as they watch an incredibly huge alien craft slowly emerge from the Arctic ice and snow after the exhausting ordeal they have lived through at the end of the 1998 American science fiction-thriller film motion picture The X-Files (also known as The X-Files: Fight the Future). I wanted to start this blog post with the headline; "An Apple A Day..." but thought better of it. That old saw simply could not do justice to what was revealed in my mind during a Documentary Editing workshop at MassArt in Boston. Another oft used journalistic cliche "follow the money" also paled in comparison to what I had finally fully figured out but, hopefully, it got your attention. The malevolent force generating my shock and awe was driven by the U.S. Tax Code. I was given "raw" video from which I was to create a scene for a class session. Never mind that the video was from a larger project creating a promotional piece. We were to create a scene from the stuff (Apple generated video files) we were given. My PC based editing program would not import the files. I tried converting it to three different video formats. Nada. Finally I resorted to using a screen recording system to make an MP4 and eventually create an HD AVC H.264 format file of the video. It easily played on my PC laptop. I labored into the wee hours this morning creating the scene for our Documentary Editing class-- a product I was truly proud to present. That was not to be the case however, due to the drastically allergic Apple incompatibility which I have come to realize is a metaphor based in reality, it would not play on the college's Apple-based systems. The reality is that the Cult of Apple is not just a metaphor. It is more than real for us unfortunate, honest, hardworking, taxpaying, U.S. Citizen. The so-called Underground Economy is much like the alien craft in The X-Files movie-- unfathomably huge in size and scope. It is unfathomable in another way too-- economic. The "left," anti-capitalists, socialists, Palestinian supporters, anarchists and other assorted radicals thrive in a tax-deductible ocean of non-profit funding. It is an economy all their own. This economy has a self-sustaining cash-flow guaranteed to forever grow and gobble up greater segments of the private sector. All this thanks to the U.S. Tax Code. So, you may rightly ask, why is this relevant on a site devoted to photojournalism? The answer is simple. Nearly all of what passes today as "news" coverage and a very large portion of so-called "documentary" film making is actually fund-raising for the non-profit underground economy. This economy is very, very fragile. The facade is structurally deficient. It is supported by an ever-more-popular disconnect from life's realities-- nothing is right or wrong, it's all open to an individual interpretation. Have you given "your fair share" to non-profit causes, and of course enjoyed the tax deductible benefit? Who's to say what "your fair share" is? Certainly, for non-profit and not-for-profit organizations, the answer is more or, put more compellingly, not enough. Think "Cars for Kids." You are being unfair unless you give "your fair share!" The question is not yours to answer. There's only one answer for the hundreds of thousands of entities and organizations that savagely consume tax-deductible funding. But wait! There's more! Slowly but surely colleges and universities long-ago became multinational conglomerate enterprises with a bewildering plethora of funding sources. Think televised college sports. Drawing money from the private sector is accompanied by intra-organizational funding and supports its "community." It doesn't stop there. So-called "non-profits" like the AARP derive a generous share of their insurance company income stream from government contracts and, of course, foundation grants. By the way, have you noticed, the qualifying age for AARP membership is no longer just "senior citizen" status. Check out AARP-branded 50+ Life Insurance - NYLAARP.com‎ to understand how this ever-expanding "non-profit" enterprise deftly expanded it market share for enhanced profitability. No wonder today's "news" is infotainment and most of documentary is political propaganda. It requires one simple ingredient-- your suspension of belief accompanied by a disconnect from reality. On July 4th, 1974, traffic crowded the streets of Danbury, Connecticut. Its citizens hitchhiked, rode bicycles, and took any means of transportation available to get to the county fairgrounds for one of the town’s most highly attended events that year. 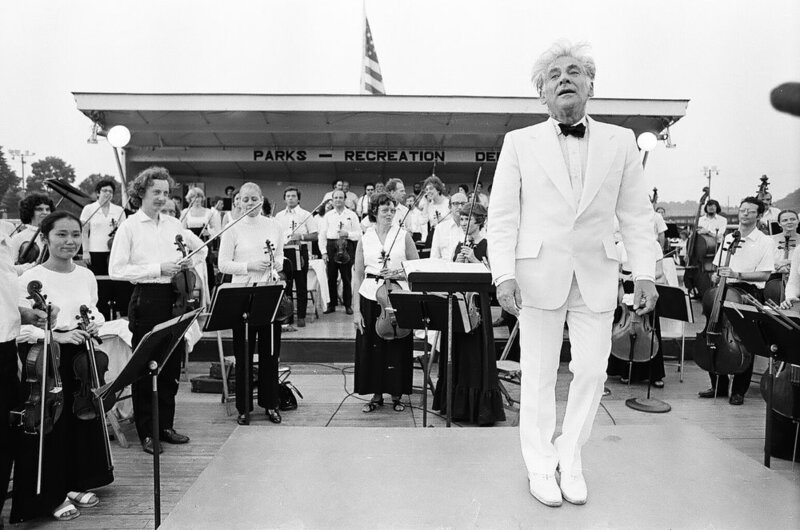 It was the centennial birthday of composer Charles Edward Ives, native to Danbury, and Leonard Bernstein had agreed to conduct the American Symphony Orchestra in a commemorative performance. The show had nearly been cancelled on several occasions. Music professor and Danbury News-Times music critic, Howard Tuvelle, spearheaded the event, and had met difficulties at every step of the way. Between struggling to gain approval to use the fairgrounds as the event’s location; Bernstein and his protege, Michael Tilson Thomas, threatening to back out; and the sweltering summer heat rendering the orchestra’s instruments untunable, it seemed as if Ives would not get the accolade so many believed he deserved. But as fate had it, those in attendance were treated to a performance of music that had not only withstood the test of time, but also whose patriotic musical compositions and politically charged lyrics appropriately depicted one the nation’s most socially tumultuous decades. David Vine, then a photographer for News-Times, was assigned to cover the event. 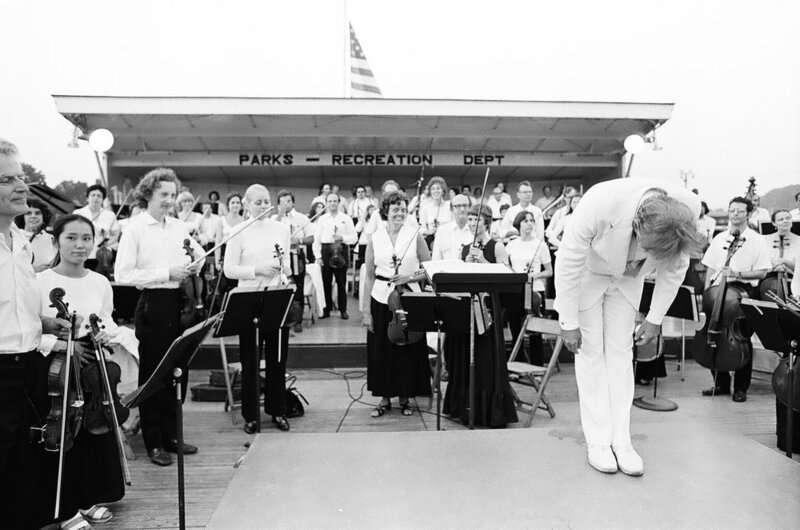 He captured images that document a historic occasion for the town of Danbury, and offer us a candid glimpse at two of the most prestigious conductors of the twentieth century. In 2005, Howard Tuvelle wrote an article for the Danbury News-Times recounting his efforts to put together an event of this magnitude entitled "Memorable Ives Concert Celebrated American Talent." Two of David Vine’s images were reprinted in this article. To read more, click here. 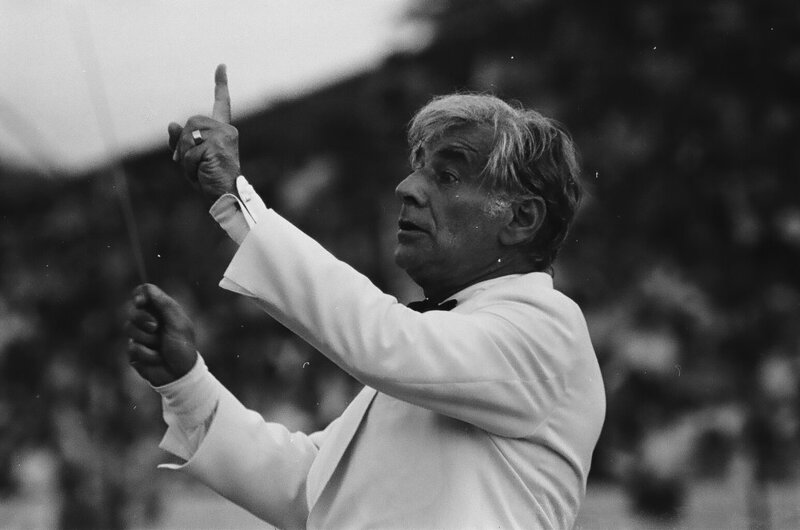 To visit the galleries of Leonard Bernstein and Michael Tilson Thomas, click here to be redirected to our Personalities page. I'm in Elmwood, NY for tomorrow's workshop and will be spending Friday night at a hotel in Danbury, CT. I'll go to the Danbury Public Llibrary at 10 and go for as long as possible. They close at 5 pm. They are open on Sunday from 1 to 5 so if need be I can go back. Saturday night I'll be starting a visit with my brother who lives in North Branford, CT. In the past, microfilm readers printed an entire newspaper page, Today I think it's printing about 20 to 25 percent of an average newspaper page at a cost of 10 to 35 cents per photocopy. Although the reproduction quality might be a bit better you still have to spend four or five times the money for a complete page, especially if you need the entire intact page. Some of the photography that I'm most proud of was reproduced on "picture pages." In fact, that was one of the draws for me to leave the New Haven Register and join the revamped Danbury News-Times. Entire newspaper pages containing photos and story by the photographer were unheard of at the Register and most other papers being printed in those days. I still think it's pretty rare for a newspaper to hand over a full page to a photographer for his own "enterprise" work. Yup, that's what they called it -- enterprise shots. We were supposed to keep a lookout for any type of interesting or unusual sights that might make for a good feature photo to fill space when needed. The economics of it for the newspaper's owners most likely drove that cost-saving decision rather than a desire to publish photographic "art." The New Haven Register set type for its pages using the Linotype hot-lead process. The News-Times used the much newer photo-offset printing process. At the News-Times a written article took a reporter's time to create, an editor's time to edit, a proof-readers time to proof and another person's time to key it into a primitive (by today's standards) computer driven optical photo-typesetting system. That system would print strips of type on photosensitive paper that would developed in chemicals. Then it would be carefully pasted onto a page that was used to make a large negative of the paste-up. The negative was used to make an aluminum printing plate to fasten onto the printing press. There were other economic reasons for the preferential treatment of photos but I won't bore you with the details of that. Suffice to say that cutting the reproduction time and cost down to less than a quarter of the time, talent and materials required to reproduce a written article and you see what I mean. The gigantic web-offset printing presses printed a "signature" which included multiple pages. If the paper needed a single page to compensate for a last minute addition of advertising it could easily be done. Pardon the long explanation but that's why it would be good to reproduce an entire page of microfilm image. In today's digital age we can easily set up a small camera to make a high-quality photograph of almost anything. If the library's microfilm system is modern there probably will be no hot-spots on the face of the viewing screen. Solving a problem like getting a full page reproduction of the microfilm image (assuming I can view the entire page on the viewer) is just one of the many reasons why I always carry a small very durable and highly convenient shoulder bag that includes my trusty Nikon Coolpix 7000. Any good photojournalist nearly always carries a camera everywhere. Add a tripod, always stowed in my Prius's trunk and your good to go for high-quality reproduction of the newspaper page or portion thereof. If you read up to this point in my rambling thanks for hanging in there to finish it. You will be rewarded in the not-too-distant future with much more detailed information about most of the photos we'll be uploading. Thanks again for visiting the site and finishing this article. Links to monographs about featured photographers via artnews. Why would anyone question a photograph of refugees in Syria waiting for food distribution in a Damascus refugee camp for Palestinians in Syria, released by the United Nations Relief and Works Agency in January? Chris Gunness, the spokesman for UNRWA is quoted in the New York Times as saying "the skepticism may partly reflect a blindness by many people to what is happening in Syria, which entered its fourth year of war this month." Photojournalism is proffered as truth and that ethic is extremely important. Sometimes truth is difficult to accept. Denying the veracity of such photographs is a serious charge. Motivation of the accuser is a key to understanding the charge of untruth. I read a book not too long ago that addressed this very issue. It is one of two books by Errol Morris I purchased after attending an interview in Washington, DC. He was honored with The Guggenheim Award and a symposium was held on June 21, 2013. The titles of the books by Morris are A Wilderness Of Error, The trials of Jeffrey MacDonald and Believing is Seeing. The later book is relevant to today's blog. The chapter "Crimean War Essay (Intentions of the Photographer)" is doubly timely on this day, March 13, 2014. According to the book "in 1855 Roger Fenton, a well regarded British photographer was sent... to photograph the ongoing war in the Crimea between British, French and Turkish forces on one side and Russian forces on the other. The image in questions is one of two entitled "Valley of the Shadow of Death." One shows a road strewn with canon balls and the other shows the road cleared with the canon balls in a ditch on the left side of the road. Liberal activist and author Susan Sontag accused Fenton of, in essence, untruthfulness. Morris set out to investigate, researched the matter, conducted interviews and examined the site where the photo was taken. Experts were involved in the study before, during and after Morris visited the location in the Crimea near Sebastopol. Morris makes a complicated and controversial story interesting. The six chapters of the book address Morris's "own endless questions about images and reality..." So, as in life itself, there are at least two sides to every story and nothing is really as it seems, at least on the surface. The accuser's motivation in both cases (UNRWA and Fenton photos) is critically important to understanding the matter in question. I will not presume to address those here. Technological advances today enable anyone to manipulate images to suit their purpose AND instantly spread false rumors that get worldwide attention. All this makes truthfulness the most important element in human communication is general and photojournalism in particular. There are plenty of photo galleries on the web ranging from Huge to small. The reason I'm writing about flakphoto is the unique vision of its proprietor -- Andy Adams, a digital producer/photo editor. I like it. I also like his motive "Partnering with artists to promote their work online." His description of the site really is more of a mission statement, "Flak Photo is an online photography channel that presents the work of artists, curators, bookmakers and photo organizations to a global audience of people who are passionate about visual culture." It surely is that. It is what I would call a "spacious" site because it is not cramped at all. Just the opposite. For example, a simple matrix of featured photos of individual photographers on "The Collection" page makes it easy to find a style you'd like to explore further. It is on that page that you get your first taste of Andy's vision. It's one that I can identify with because all of the selected photos appealed to me. The photographers' work I examined were more documentary rather than journalistic in nature. Less reporting, more telling. Search by Image. Search by Face? Countermeasures? If you haven't already seen Google's search by image function you'll be amazed at what it can do. My only beef with Google is that over time they eliminate services many people (myself included) have come to depend on. Tin-Eye's reverse image search engine was launched in 2008. I believe they were the first company to demonstrate a working system that could be used to search for duplicate or close-match images. It does not search the web per se. Tin-Eye's technology searched a database of images the company crawled using web search engine technology. They no longer provide the free demo search they once offered. Two or three years ago Google launched reverse image search via its Image Search engine. Many people who regularly use Google web search don't realize that Google also provides several other specialized and free search engines. Image Search is one such engine. The small camera icon located inside the Image Search box, at right, is the button that activates the reverse search function. Click the camera icon and you can either paste a web-based image address (URL) or upload an image file. With a second or two Google provides a selection of matches or close matches. There are even ways to refine the search. For example, using Firefox I right-clicked on a news photo of a commercial jet aircraft and copied the link location. Then I pasted it into the "Past image URL" field and clicked search. Not surprisingly, Google displayed the same photo and article but below that there was a section for "Visually similar images." There's also a link for "Search tools." Click that and you get a few refinement capabilities including limiting the time-frame of the search results. If you have the Android OS on one of your mobile devices there are apps that take advantage of the Google's reverse image search capability. One of those apps is Google Goggles. It has been around for a few years. It works sometimes and that's the best I can say for it. Google's Reverse Image search works much better. Now for the fun (or scary) part. There will come a day, probably sooner rather than later, when you can reliably do real-time search by face image and find information about the person whose image you are capturing with your device. Google Glass may soon be able to reliably use instantaneous facial recognition technology to background a person. A company seeking funding claims it will do just that. So, do we eagerly await the development or do we start writing our Congressperson to complain? That's a hard question to answer. Once the technology genie is out of the bottle it is impossible to put it back into the bottle and cork it up. What I do see coming down the pike is a whole new industry of countermeasures, similar to current Electronic Warfare Self Protection systems. Decades ago when anti-aircraft missiles were first guided by ground and missile based radar countermeasures were developed. During the 1980s I did some marketing work for the company that was developing the U.S. Navy's Airborne Self-Protection Jammer system. There's also a High-speed Anti-Radiation Missile that does the job by destroying the ground based tracking radar that guides some anti-aircraft missiles. So, why not truly "disruptive" technologies that will defeat instantaneous facial recognition? I suppose if you employ them in the future you'd probably run the risk of being a suspicious person, someone who doesn't want his picture taken. I hope not. This morning I was discussing with Beverly the subject of retouching and "enhancing" my digitized negatives and transparencies. We talked about some of the spots she removed in one of the photos. I said some of the spots may not need to be retouched if they look like they belong in the photo. That got me to thinking about the importance of tiny details in photos. Several months ago I read "Believing Is Seeing" by documentary filmmaker Errol Morris. The book has four sections. Within the four sections are six case studies in photographic detective work. Morris was a private detective earlier in his career and he apparently applied investigative skills in examining photographs to derive information from minute detail. Much more than writing about the history surrounding the photos, Morris delves into the photos in an extraordinary way. He examines minuscule details to derive additional meaning or interpretation from the images. The detailed study of the infamous Al-Jamadi photos from Abu Ghraib prison in Iraq and specifically the photo whistleblower Sabrina Harman, one of the soldiers accused of wrong-doing was undertaken. Harman provided the photos that drew public attention to the situation. He interviewed an expert in "Smile Science" and who claimed Harman's smile was not a smile of enjoyment. She was leaning over the body of a dead Iraqi prisoner giving a thumbs up gesture. That conclusion provided some weight to the argument that Harman was not at fault but rather an unwilling participant in the whole affair. It's one of several fascinating stories Morris tells regarding six famous images he examines in a search for greater meaning in the mostly historic photos he examines. This is an unusual and most appropriate supplement to photojournalism. My photos, though not nearly as historical, are journalistic in nature. Therefore retouching is a form of editing. How much editing is required or even desirable? The conclusion I come to is that the overall meaning of the photos must not be altered but any details that would distract from that meaning can and should be altered.